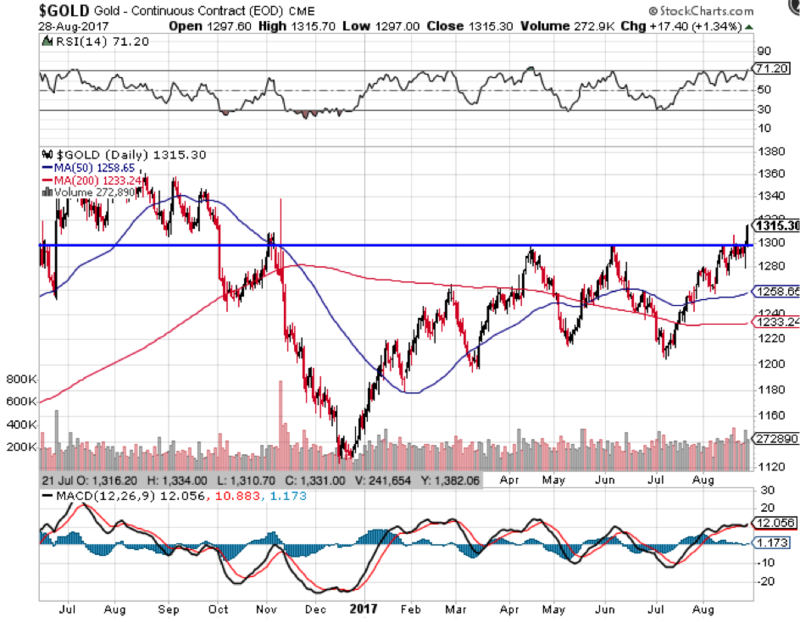 After being range bound and unable to break through the key US $1,300oz level since Nov 2016, gold has staged a sharp rally overnight on the back of heightened tensions on the Korean Peninsula. Early on Tuesday morning Australian time, North Korea fired a missile that flew over Japan and landed in the Pacific waters off the northern region of Hokkaido. Unsurprisingly, the news has rattled markets, and was enough to send gold above USD $1,320oz this morning and in AUD to $1,665oz. Silver too found a bid and rallied to USD $17.47oz and back above $22.00oz in AUD. The importance of the USD $1300oz level can be seen in the chart below, which plots the price of gold on a daily basis slightly longer than one year. As you can see, gold previously failed to push through its previous two attempts at this level, both times declining down toward the USD $1200oz level. Should the yellow metal stay above USD $1300oz this time, investors around the world will take note, and have significantly more confidence that this new uptrend that is developing will stick, and that a new bull market is in play. 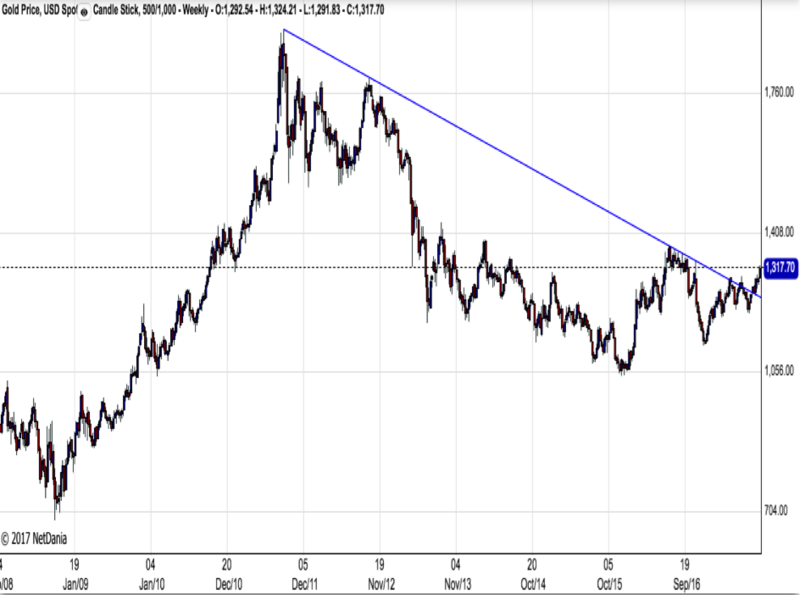 Already in 2017 we have seen gold in USD clear a very important downtrend line from 2011 seen below, and this breakout north of the key USD $1,300oz handle is another important hurdle. With equity markets expensive, traditional defensive assets offering little in the way of real yields, volatility close to all time lows, a weakening USD, and ever more question marks about the pace of fed rate tightening, there is no shortage of potential catalysts to push gold higher from here. As such, even if the yellow metal gives up some of its overnight gains (which wouldn’t be unexpected), risk conscious investors would do well to take a look at gold, and the role it can play in their portfolio today.